Our coaches are dedicated to promoting skills, strength, and endurance to develop confident athletes in the sport of everyday life. 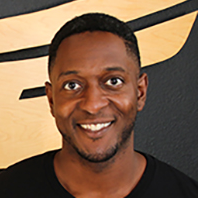 Maurice Revels, also known as Mo, has been a personal trainer since he graduated from Texas Tech in 2006 with a degree in Exercise Sports Science. He graduated from Colleyville Heritage High school and received a football scholarship to the Air Force Academy in 2001. Playing sports and training his body to perform at its best have been his life long passions. He has now put that same focus, drive, and hard work that he used to excel in sports, into each person he comes across that has a fitness goal; whether it is sport specific, weight loss, weight gain, rehab or just overall fitness. Bradon graduated from Colleyville Heritage High School in 2014. After graduation, he attended Texas A&M University-Commerce where he played football for one year. Bradon obtained his Personal Trainer Certificate from ExpertRating and is now pursuing a degree in Exercise Sports Science.